Wanda Chambers uses glass in her creations. Photo: Richard Aiello. There were many highlights to my recent New York City visit and one of them involved stylish ladies and hats. I was lucky enough to attend the opening reception for the Milliners Guild hat exhibition held at the National Arts Club in Gramercy Park. Titled Night and Day, the exhibit featured the designs of 30 milliners. Each milliner created two hats – one for evening and one for day. Guild Vice-president Lisa Shaub goes for a touch of elegance. Photo: Richard Aiello. 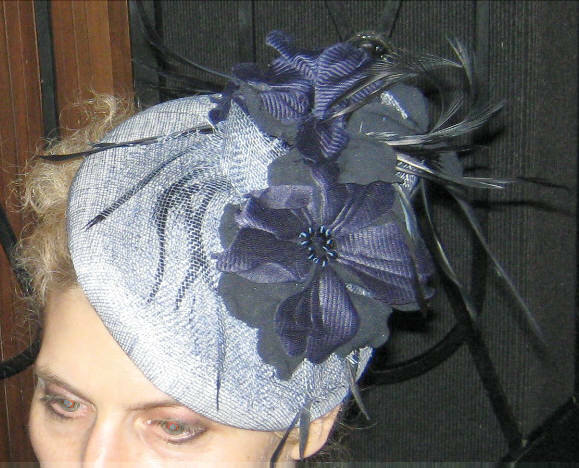 The Milliners Guild is an organization of hat makers and sellers working together to support their shared interest. Through a website, special events, and educational opportunities the Guild is dedicated to spreading the good news about hats for making, wearing, and stylin’. I decided that for this special occasion I would crown myself the Official San Francisco Representative and don my own creation – the Golden Gate Bridge fascinator I made for last year’s Art Deco Society of California Preservation Ball. It was a smash hit with the exhibition crowd, but nothing compared to what the real milliners were wearing not to mention what was on display. 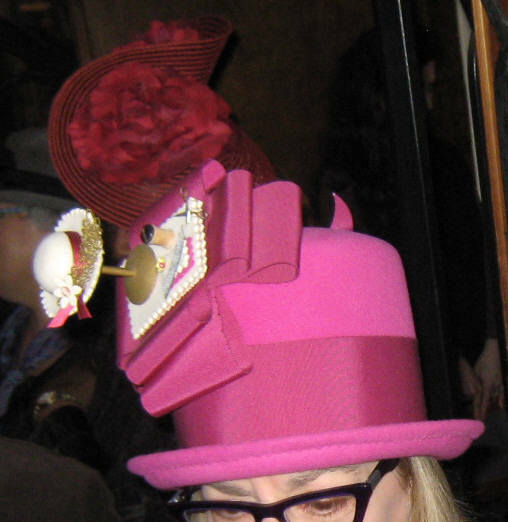 Guild President Linda Ashton tips her hat to milliners with her creation. Photo: Richard Aiello. There were creations of all shapes and sizes: top hats and cloches, brimmed hats and veiled hats. Cigmond Meachen went witty with a lamp shade silhouette while Lisa Shaub (Guild vice-president) offered a touch of elegance with her creations. Overall it was an inspired showing. The place was packed with hat admirers, including some of the ladies from Advanced Style. Stay tuned for more about that. A big thank you to milliner Jasmin Zorlu for the invitation. I truly had the best time. The Duchess of Cambridge has an amazing sense of grace and style. It’s a huge honor to dress her, and she is an incredible ambassador of British fashion. Sarah Burton, creative director of the Alexander McQueen label, in an interview with Harper’s Bazaar. Oh, never mind the fashion. When one has style of one’s own, it’s always twenty times better. 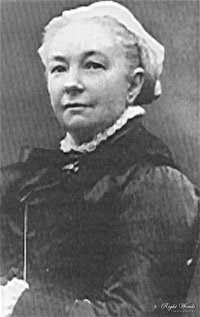 – Margaret Oliphant (1828-1897), Scottish author. 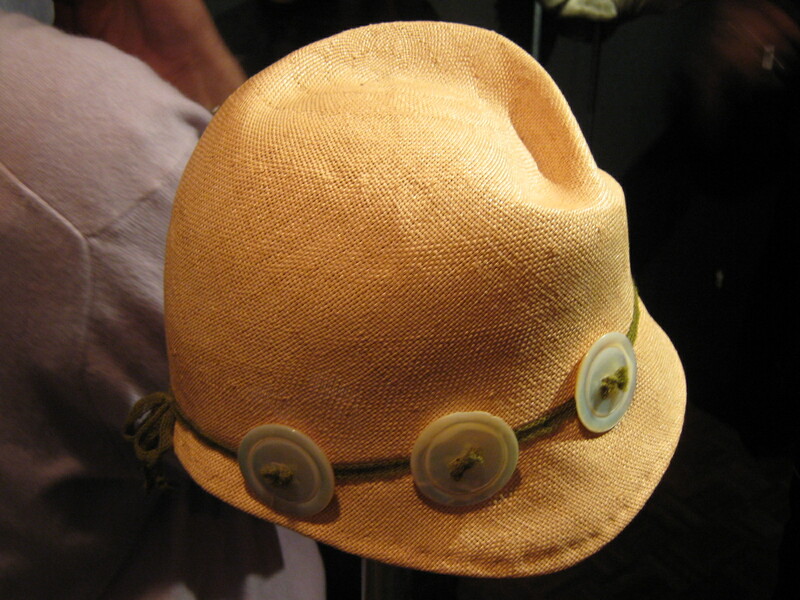 Straw button hat by Linda Ashton. Photo: Richard Aiello. Over Dressed for Life is in NYC this week collecting fashionable stories. 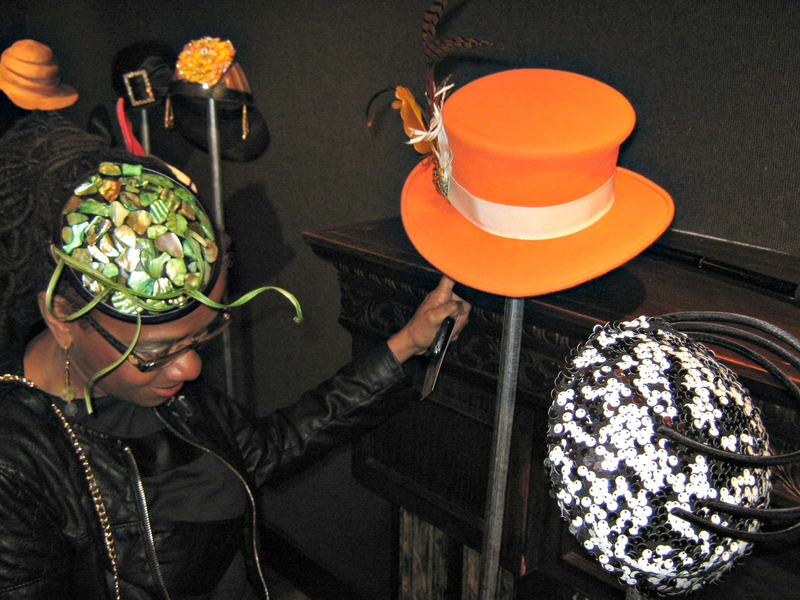 Including the opening reception for Night & Day – an exhibition of hats by members of the Milliners Guild. Stay tuned for more. The Spring 2013 Vintage Fashion Expo in San Francisco is coming up on March 16th and 17th at the Concourse Exhibition Center. 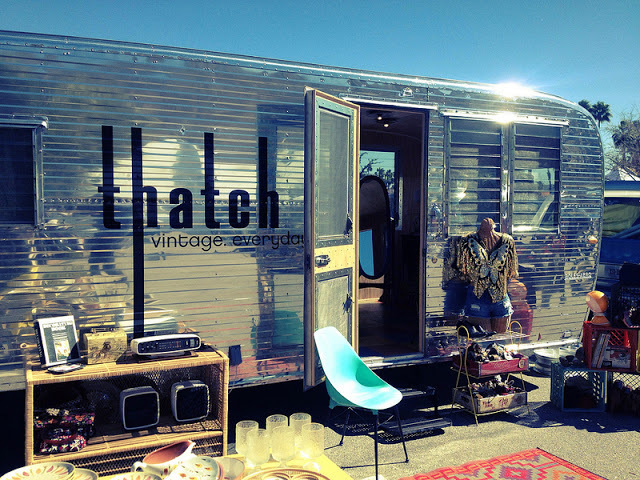 New to the Expo this season is the celebrated Thatch Vintage and their Vintage Mobile Boutique, a converted Silver Streamlined Boles Aero trailer. Air-conditioned and handsomely outfitted, this super-cool vintage trailer is complete with all the standard ‘brick-and-mortar’ amenities such as showcase lighting and a private dressing room. We all can’t wait to see that, not to mention the 80 or so other dealers from around the country showcasing the best in vintage spring fashions. Vintage is always stylish and spring 2013 trends include cardigan sweaters in shades of pink and green, scarves in solids and floral prints, two-tone mod printed everything (thanks to Marc Jacobs) and dresses, dresses, dresses of all silhouettes. The Vintage Fashion Expo, Saturday March 16th and Sunday, March 17th at the Concourse Exhibition Center, 8th & Brannan, SF. Click here for more information. Is fashion art? I think it’s sometimes very creative, but I’m not sure I would call it art; that’s pushing it a bit. I certainly don’t think fashion photography is art, because if it is art, it’s probably not doing its job … In fashion photography, rule number one is to make the picture beautiful and lyrical or provocative and intellectual – but you still have to see the dress. Of course, I like to push the boundaries; I think that’s the most interesting element much of the time, when you walk the line. But you can’t forget to show the clothes and, in that end, not alter them beyond recognition; to pretend a dress is something it is not is unfair to the reader, too. – Grace Coddington, creative director at Vogue. This quote is taken from Ms. Coddington’s memoir, Grace (Random House, 2012), which I just finished reading and I throughly enjoyed. 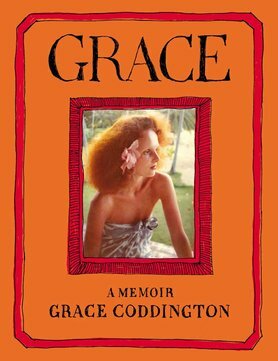 Ms. Coddington’s stories are brief, interesting and unpretentious. Crossing good humor with a sense of earnestness, she describes her 1940s and 50s childhood in Anglesey, a small island off the northern coast of Wales, and her life as a model in Swinging Sixties London. Later she goes into detail about working first at British Vogue and later at US Vogue with editor-in-chief, Anna Wintour. She spends quite a bit of time discussing her favorite photo-shoots and the book includes plenty of photos (a rarity these days) as well as Ms. Coddington’s charming sketches of herself, her colleagues, and her beloved cats. Grace is an entertaining and informative read for anyone interested in a behind-the-scenes personal tour of fashion publishing.